Nine women in Sweden have received womb transplants from living relatives in a pioneering trial. Dr Mats Brannstrom, of the University of Gothenberg, who has been leading the experimental fertility project, hopes the technique could help other women who want to become pregnant. He says up to 15,000 women in the UK could stand to benefit. Dr Brannstrom's team recruited 10 women to their trial. One could not proceed with the trial for medical reasons, but nine went on to have a womb transplant. Scientists in Britain and elsewhere are also planning similar operations but the efforts in Sweden are the most advanced. There have been two previous attempts to transplant a womb - in Turkey and Saudi Arabia - but both failed to produce babies. 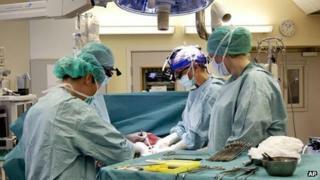 "This is a new kind of surgery," Dr Brannstrom told Associated Press in an interview from Gothenburg. "We have no textbook to look at." He and colleagues will run the first workshop on how to perform womb transplants and they plan to publish a scientific report on their efforts soon. The transplant operations did not connect the women's uteruses to their fallopian tubes, so they are unable to become pregnant naturally. But all who received a womb have their own ovaries and can produce eggs to be used for IVF treatment.